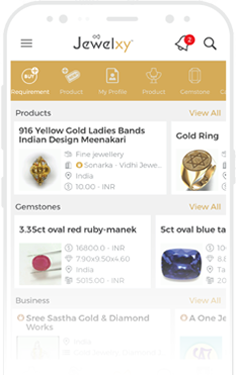 FAQs, How different is Jewelxy from other jewellery portals apps? Is Jewelxy a typical eCommerce portal? No, Jewelxy is a gems and jewelry business marketing and networking portal. How different is Jewelxy from other jewellery portals? Jewelxy is business-to-business (B2B) and online-to-offline (O2O) marketplace. It offers offline business the best online digital marketing solution to reach and attract potential customers, generate leads and increase sales. Also, connects buyers and sellers and help them grow business network. What benefits does Jewelxy offers? Jewelxy helps you introduce your business on the global marketplace and grow your business up to a next level. How do I register on Jewelxy.com? Registering your business is quick, easy and free. Step 2- Fill in the required information. Step 3- Click 'Create My Account'. Note : In order to get your account activated, you need to furnish more details like : Company profile, identity documents, products or service you offer and also verify your contact information. Who can register / join? It is open to anyone associated with gems and jewelry industry ecosystem. Business or individual primary dealing in jewelry manufacturers, wholesalers, suppliers, importer, exporter, retail jewellers etc and service providers. Yes, currently there are 100,000+ listed Buyers & Sellers from 100+ Countries in over 26+ Categories across the globe. Do I have to pay commission on sell? No, Jewelxy do not charge any commission or transaction fees. All kind of buying or selling deals will be conducted offline directly between buyers and sellers. Is Jewelxy a typical business directory? It offer you the with necessary tools to grow your business faster, such as Networking, Marketing and Communication and more. Digital Shakha is your very own professional business website to showcase your products and offers. I don't sell products on online portals. Don't worry, now it is easier with your Digital Shakha to redirect online customers to your shop. What are the available options for paid membership? We offer exclusive digital marketing features to Let Your Business Grow And Thrive! For your convenience, we accept all major credit cards: American Express, VISA, MasterCard, RuPay, UPI etc. We use industry standard secure online payment gateway services offered by CCAvenue and PayPal. How can I avail paid membership? Click here or visit Plan page and select your preferred membership plan. Then click add to cart and proceed for the payment. Your plan will be activated, once we have receive clear funds in our account. I have multiple businesses, can I add all of their listings to same name? No, you cannot add multiple business with same name or user name. You can only list multiple business using a unique mobile number and email address associated with individual business name. You can also add multiple branches for business, such as Head Office, Shop, Factory etc. How can I make changes to my business directory listing? Step 1- Visit login page and login to your account. Step 2- From the Dashboard click on profile button. Step 3- Now click Edit button, do the necessary change and save it. Your profile details will be manually verified by support team and once done, it will be live. I have submitted a form without an error message. Why has my business not listed? After your account is registered, you will receive a verification code (OTP) to verify your mobile and email address accordingly. Usually within 48 hours our support team manually verifies each business profile and once approved, it goes live. You always can check your profile verification status from your dashboard (Approved / Pending).